This field seems to be dominated by out of state competition with Michaela Reinhart (Lexington Catholic, KY) leading the way in our virtual meet. She has a PR 30 seconds faster than the rest of the field with a 17:25 that she ran two weeks ago. Kaylee Dupont (South Forsyth, GA) comes in as the only other girl with a sub 18 performance so far this season with a 17:55 seasons best mark. Dupont is familiar with this course and ran 17:57 for 15th at Footlocker South last season. Freshman Mari Cagle Lockhart (Daniel, SC) has already been dominant on against high school competition as a middle schooler last season, and set a new PR of 18:07 two weeks ago. She is the reigning SCHSL AAA State XC Champion from last year and has certainly stepped up her game since claiming that title. Riverside's (SC) entire top 4 has run under 18:25 in their high school careers lead by Jessie Crowley and Abigail Smith who have PRs of 18:09 and 18:11 respectively. They'll aim to have their top 4 girls under the 18 minute mark this weekend. 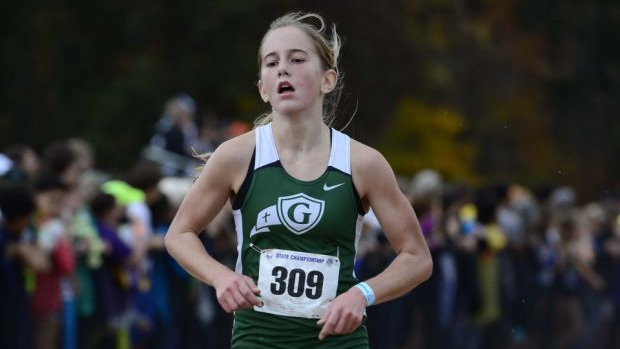 Katherine Dokholyan and Clare McNamara (Chapel Hill) are coming off of a big 1-2 finish at Greensboro XC Invitational last weekend and have PRs of 18:37 and 18:45 respectively. Cardinal Gibbons girls have looked very strong so far this season with a strong pack of four girls leading the charge including Sloan Walter, Marissa Bishop, Annie Pierce, and Katharine Priu. They've run together for the first half of their races at Knights Crossing and adidas Challenge, and I'd expect them to do the same here. Walter didn't run adidas Challenge due to a sickness, but was their top girl at Knights Crossing. Other big names entered in this field that you need to keep an eye on are Rebecca Kefer (NW Guilford), Calli Parlier (Apex), Kate Eiselt (Myers Park), Madi Marvin (Chapel Hill), Anna Stouffer (Chapel Hill) and Sarah Bechtel (Weddington) who all have the potential to run under 19 this weekend. As strong as Cardinal Gibbons and Chapel Hill have looked this season, Riverside's top 5 look to be too strong to defeat this weekend, but I don't think it'll be by as wide of a margin as the virtual meet indicates. Gibbons, Chapel Hill and South Forsyth (GA) are only separated by 5 points on our virtual meet which will make for an extremely intense battle for 2nd on Saturday. The top entry according to our virtual meet is Connor Lane (Cardinal Gibbons), but he will be racing at Great American CC Festival to defend his home turf against national caliber competition in the Race of Champions. The rematch between Cameron Ponder and him from the NCHSAA 4A Outdoor 3200 will have to wait until the 4A Midwest regional meet. Cameron Ponder (Mt. Tabor) has not raced other than a tempo at his conference preview meet last weekend so far this season. He is hoping a extended training block will benefit him at the end of the season, but we finally will see him open up and he should be in phenomenal shape. Conference rivals John Tatter and Todd Holbrook (RJ Reynolds) will look to challenge Ponder and they have been off to a hot start this season. The teammates set new PRs two weekends ago at adidas XC Challenge of 15:24 and 15:29 respectively and will look to do so once again this weekend. Ben Savino (Apex) looked really strong at Friday Night Lights, but came down with a sickness before adidas Challenge the next week. He ran 15:51 beating David Melville, who went on to run 15:24 the next weekend. This indicated Savino is in fantastic shape and should not be counted out as a contender to win this race if he is healthy. Ben Cignarale (Riverside, SC) was 5th at Providence Invitational on the same course earlier this year running 16:21. Two weeks ago he ran 15:39 for a new PR, and he comes in at 4th on our Virtual Meet. Nick Cooke (Etowah, GA), Jamie Witmer (Hoggard), Andrew Castano (Riverside, SC) and Michael Moerk (Mount Tabor) are the only other boys in this field who have broken 16 so far this season. 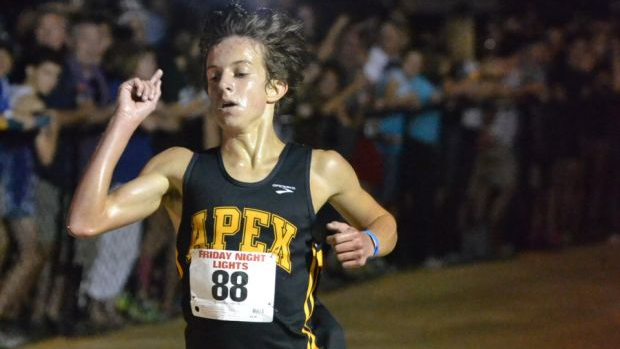 David Cart (Apex) was very strong running 16:01 at Friday Night Lights, but like his teammate Savino also came down with the flu before adidas Challenge. If healthy you can expect a huge PR for Cart this weekend. Sam Grelck and Sam Thornton (Cardinal Gibbons) have both run 16:00 this season and hope this fast McAlpine course can bring them both under the 16 minute barrier for the first time this year. Others to watch out for this weekend are Charles Pace (Mount Tabor), Haywood Ferguson (South Mecklenburg), Zachary Mercer (Mooresville) and Nick Thompson (NW Guilford). Thompson and Mercer were 3rd and 5th respectively last weekend at Greensboro both running 16:21. They'll both challenge the 16:00 barrier this weekend. With Gibbons missing their #1 it'll be up to RJ Reynolds to defend their NC territory vs out-of-state powers Riverside (SC) and South Forsyth (GA). RJR will be without #3 man Thomas Anthony who will be taking the SAT, but they looked strong last weekend as a team at Greensboro Invitational. If Mt. Tabor adds in Cameron Ponder to the virtual meet it puts them right there in contention with Riverside as well. With it being an SAT weekend it is hard to predict who has their entire top 7 available to run.